The Poodle names list is loaded with names suitable for your pup. Some are associated with the breed’s look, like “Curly,” as well as other names you might often think of when you picture this adorable and popular dog. Ever heard of John Steinbeck, author of the Pulitzer Prize-winning book, The Grapes of Wrath? He had a blue (black) standard named Charley. Winston Churchill, the famous British leader, had two miniatures, but I could only add one name to the list. Why? Both of his dogs had the same name: Rufus. This list includes dog names that sound stately or important, which is often how this well known breed is pictured. Names like Sophie, Penelope, Walter and Queen are on the list, as well as others I just like. Something to keep in mind when naming your Poodle puppy is to match your dog’s personality and purpose with their name. Maybe you want to choose from a list of famous dog names or one syllable dog names. Or maybe you want to name your pup for a very personal reason, such as to remember someone special. 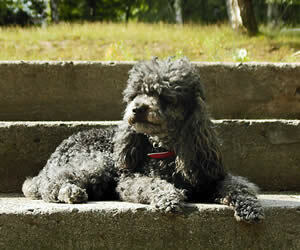 To learn more about this dog breed, visit our Poodle dog breed information page. It’s always a good idea to learn about temperament, trainability, and even a little of the breed’s history before settling on a new dog. It’s also fun. Below is a list of my favorite 101 Poodle names. Browse or study the list and have fun. Alice Truth and Noble nobility. Anna Equivalent of Anne – Full of grace. Bronson The brown haired one’s son. Cleo From Cleopatra – Her father’s glory. Coco A drink. A favorite among Poodle names. Curly Having curls or wavy hair. Daisy The day’s eye. A flower with a yellow center and white petals. Ellie From Elizabeth – Consecrated to God. Famous Name: Ellie Goulding or Elena Jane Goulding in real life, is a British singer, songwriter and musician from Lyonshall, Herefordshire, England. She released her debut album, Lights, which reached #1 on the UK charts. She also sang at Prince William and Kate Middleton’s London wedding on April 29, 2011. Fred From Frederick – Peaceful ruler. Henry Ruler of the estate. Jackie From Jacqueline – The supplanter. Famous Name: Jackie Chan is one of the most famous Asian actor and also, was already the highest paid actor in Asia. Aside from being a successful actor, he is also director, producer, action choreographer, stuntman, etc. Some of his films are Half a Loaf of Kung-Fu (1980), Drunken Master (1978), The Cannonball Run (1981), Police Story (1985), Supercop (1992, with Michelle Yeoh), Rush Hour (1998), Shanghai Noon (2000, with Owen Wilson and Lucy Liu), The Tuxedo (2002, with Jennifer Love Hewitt), and Shanghai Knights (2003, again with Wilson). Jewel A precious stone or gem. One that is treasured. Latte Expresso coffee mixed with steamed milk – a café latte. This is also popular among Poodle names. Layla Born at night or dark haired. Lucy Light – one who brings the lamp of learning to the ignorant. Famous Name: Lucy Liu is a 45-year-old TV and film actress from New York City. He studied at University of Michigan in which she auditioned for the University of Michigan’s production of Alice in Wonderland and got the lead role that leads to her interest in acting. She got her breakthrough role when she auditioned for the part of Nelle Porter, the icy new addition to the wacky law firm Cage and Fish on the hit comedy Ally McBeal, created by David E. Kelley. Maurice Moorish looking – dark complexion. Famous Name: Born in Salzburg, Vienna, Johann Chrysostom Wolfgang Amadeus Mozart or also known as Wolfgang Amadeus Mozart (January 27, 1756 – December 5, 1791) was one of the most influential of all composers of Western classical music. He wrote his first symphony when he was eight years of age and his first opera at 12. Natalie Born at Christmas time. Famous Name: Natalie Hershlag or known as Natalie Portman as her screen name, is a jewish Hollywood actress from Jerusalem, Israel. At the age of 11, she was discovered by an agent in a pizza parlor. Her first debut film was: “The Professional (1994)”. Nicole Victory of the people. Feminine form of Nicholas. Penelope Greek meaning faithful and the weaver. Philippe French for “friend of horses”. Perfect if your dog is actually friends with horses. Poppy Flower with four crumpled petals in red, orange or white colors. Rufus Name of Winston Churchill’s Poodle. Sarah Princess, one of royal status. Shadow A rough, dark image cast by an object blocking the sun’s rays. Stella From Estelle – bright star. Tara Towering rock. The home of the ancient kings of Ireland. Tuscany A perfect mix of beauty, peace, sharpness, and intelligence. Walter Mighty warrior. This is one of my favorite Poodle names. Can’t find the name you like on the Poodle names list? Don’t give up. Return to our Dog Names by Breed page to do some more exploring. If you have a great name, tell us about it!